Each of the 8 guest rooms contain the following: King or Queen bed with Egyptian cotton bedding and 4 hypoallergenic pillows, overhead light with ceiling fan, private en-suite bathroom (with whirlpool as noted), flat panel TV with cable TV and HD inputs, free Wi-Fi, power cube with 4 outlets and 2 USB ports, alarm clock with iPod dock, complimentary water bottles and chocolates and air conditioning (in season). Our premiere guest room sees to every detail of Victorian luxury with solid mahogany furnishings. Located on the first floor. Room features: Luxury king bedded room with fireplace, full en-suite bath with oversized jetted tub and shower. 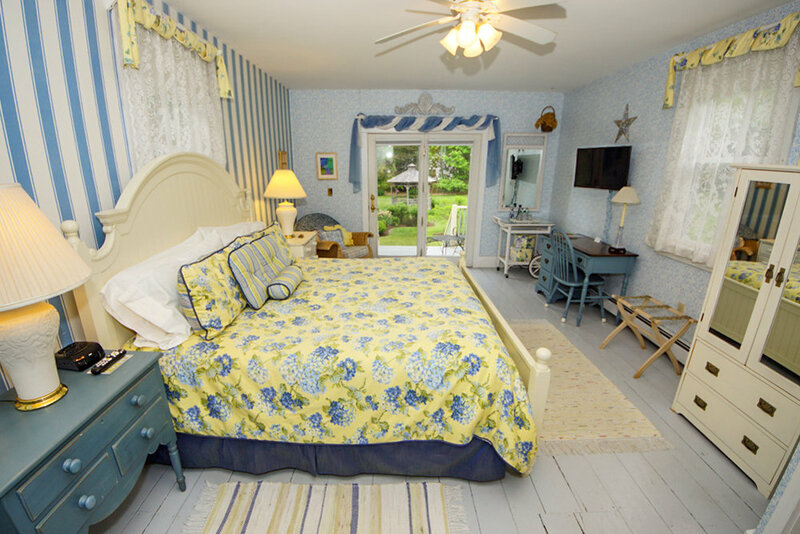 As light and airy as a romantic Victorian sea-side cottage, the Island Cottage Room, decorated in shades of country blues, yellows and whites, will delightfully set you back in time. Located on the first floor. Room features: Luxury king bedded room, writing desk, full en-suite bath with jetted tub and shower, french doors with private deck and seating area. The queen-sized French "Normandy" bed anchors the former master bedroom providing an ambiance of luxury and style. Located on the second floor. Room features: Luxury queen bedded room, sitting area, full en-suite bath with jetted tub and shower. Romance abounds in our largest guest room featuring luxury appointments and classic Victorian style. Located on the second floor. Room Features: Luxury queen bedded room, sitting area, full large en-suite bathroom with clawfoot tub and separate shower. The vintage linoleum flooring sets the tone and color pallet of this classic victorian guest room. Located on the second floor. Room Features: Standard king bedded room or 2 extra long twin beds, full en-suite bathroom with tub and shower. A queen-sized cherry sleigh bed anchors this guest room in classic victorian style. Located on the second floor. Room Features: Standard queen bedded room, full en-suite bathroom with tub and shower. Eastlake victorian era furnishings compliment the home's authentic architectural style. Located on the second floor. Room Features: Standard queen bedded room, en-suite bathroom with stall shower. This intimate room harmonizes the warmth and character of turn-of-the-century style. Located on the first floor. Room Features: Value queen bedded room, en-suite bathroom and separate en-suite tub/shower. Pets & Smoking Policy: LimeRock Inn does not allow pets. We are happy to make a referral to a local facility to watch your pet during your stay. Smoking is not allowed except in designate outside areas. A cleaning fee of $250 will be applied to your bill if it is determined that these policies were broken. Cancellation Policy: LimeRock Inn is a small facility and last minute cancellations greatly impact us negatively. All reservations cancelled greater than fourteen days prior to arrival will be subject to a minimum $25 administrative fee per room booked*. If you cancel fourteen days or less from your arrival date, you will be responsible for the full amount due. *In addition, any holiday/event reservation OR any reservation greater than three room nights (Example: 1 room for 4 nights, 2 rooms for 2 nights) will be subject to an additional cancellation fee equal to one room night per room booked at the applicable room rate. Holiday and event weekends include: New Year’s, MLK, Pies On Parade, Valentines, Memorial Day, July 4th, North Atlantic Blues Festival (mid-July), Maine Lobster Festival (early August), Maine Boats Homes & Harbor (mid-August), New England Auto Auction (mid/late-August), Labor Day, Columbus Day, Thanksgiving/Festival of Lights and Christmas. Contact your innkeeper with questions or for more information. Trip Insurance: We understand that reasons beyond your control may result in your need to cancel this reservation. That’s why we encourage you to consider purchasing travel insurance and suggest using www.insuremytrip.com. Our 14 day cancellation policy is commensurate to our area and reflects the adverse impact cancellations have on our business. We appreciate your understanding.